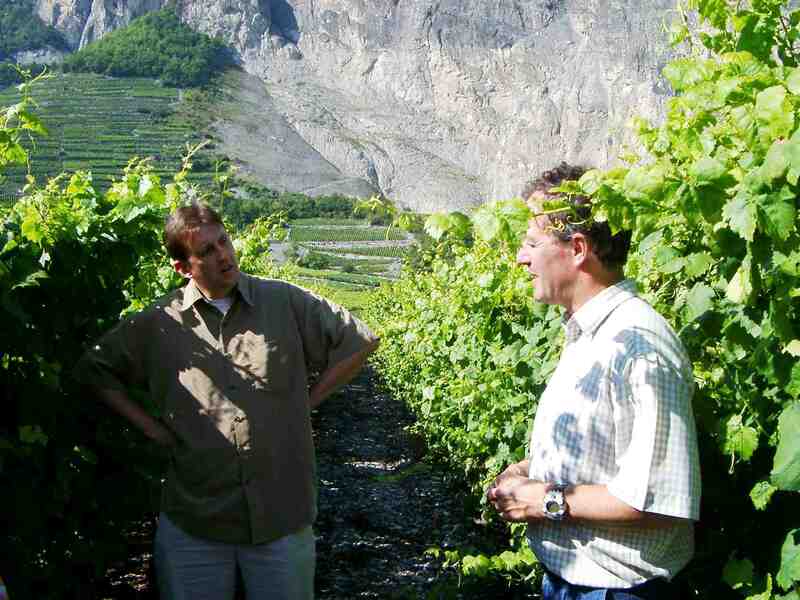 Marchesi di Grésy cellar master Jeffrey Chilcott in the vineyards of Valais Switzerland with winemaker Axel Maye. It’s a question many Anglophone oenophiles ask when discussing their winery adventures in Piemonte’s Langhe. Most often, the answer is “yes.” Those who answer affirmatively know the delights of educationally intense oenological experiences with Chilcott at the famed Barbaresco winery, Tenute Cisa Asinari dei Marchesi di Grésy. Whether a Nebbiolo novice or an experienced lover of Barbaresco’s strong tannins that, as legendary winemaker Franco Boschis says should, “stab the palate,” a wine tasting with Chilcott should top every wine traveler’s bucket list. Tasting room at Marchesi di Gresy. Recently Greg Eyon, partner and wine director at Vin48 in Avon, crafted a solution for Barbaresco-philes. The same week the skiing world schussed into Beaver Creek and Vail for the 2015 Alpine Skiing World Championships, Jeffrey Chilcott sped through Colorado, with a whistle stop in Vail Valley. Cellar Master Jeffrey Chilcott performing one of his favorite tasks, showing off the wines of Marchesi di Gresy. On Tuesday, February 3rd, Chilcott poured flights of three of Marchesi di Grésy’s wines, including Barbaresco Martinenga, for diners in the bar and main dining room at Vin48. To drink the rich and expressive wines of Marchesi di Grésy is to sip fruits from ancient times. Barbaresco, like all of Langhe, is steeped in ancient history. The famed Marchesi di Grésy winery lies in Martinenga, at the base of the south facing natural amphitheater above the Rio Sordo valley. Long before vineyards carpeted the Langhe hills, Martinenga was home to vast oak forests, symbols of strength to barbaric tribes who preceded the Romans in Barbaresco. The Liguri Stazielli worshipped there to the Celtic god of strength “Martiningen.” Conquering Romans kept the war theme and named it “Villa Martis” in honor of Mars, their god of war. It’s also the birthplace of Roman Emperor, Publio Elvio Pertinace in 126 A.D. The amphitheater of Martinenga and the Marchesi di Gresy winery in Barbaresco. Worshippers still flock to Martinenga, a temple of strong, bold Nebbiolo wines from Barbaresco’s largest cru monopole. The 29.5 acres of prime Nebbiolo vines bear fruit for Marchesi di Grésy’s three Barbaresco D.O.C.G. : flagship Martinenga and kingpins, Camp Gros and Gaiun. Like many Piemonte family-owned wineries, the di Grésy family’s continual presence on land Alberto di Grésy now farms began centuries ago. In 1797, the noble di Grésy family purchased the Martinenga property to add to their holdings atop the area’s highest hill, Monte Aribaldo in nearby Treiso. For nearly two centuries, the di Grésy family produced and sold their prized grapes in the Alba grape market each autumn. 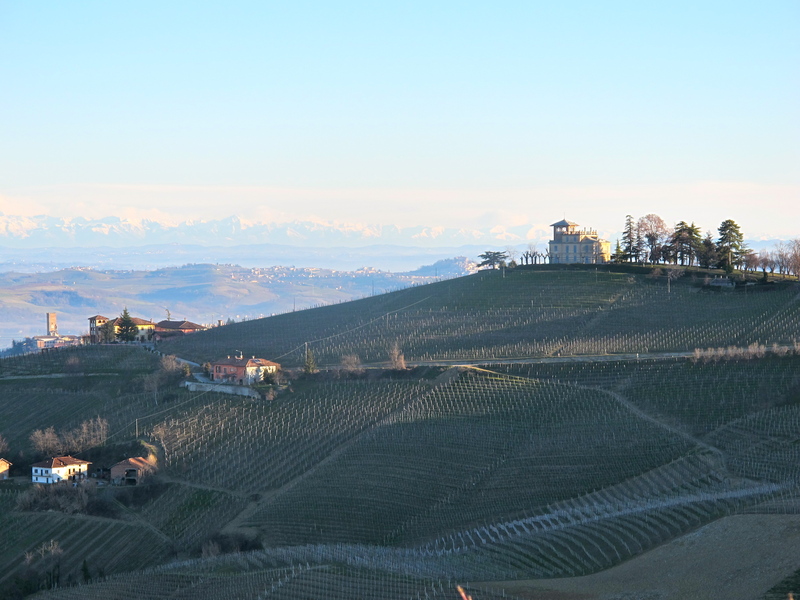 Silhouette in the early spring morning light of the di Gresy family’s Langhe home Villa Giulia atop Monte Aribaldo, the highest point in Barbaresco. German forces used the villa as a headquarters during their occupation of the region during the waning years of World War II. Alberto di Grésy assumed control of the estate in the 1960s. Not surprisingly given di Grésy’s drive and determination, he grew weary of seeing others reap the rewards of converting the fruits of their labors into wine. In 1973, in the early days of Angelo Gaja’s successful Herculean efforts to place Barbaresco on the same world stage as the older, larger and much revered Barolo denomination, di Grésy produced his first distinctive wines labeled with the family’s crest. 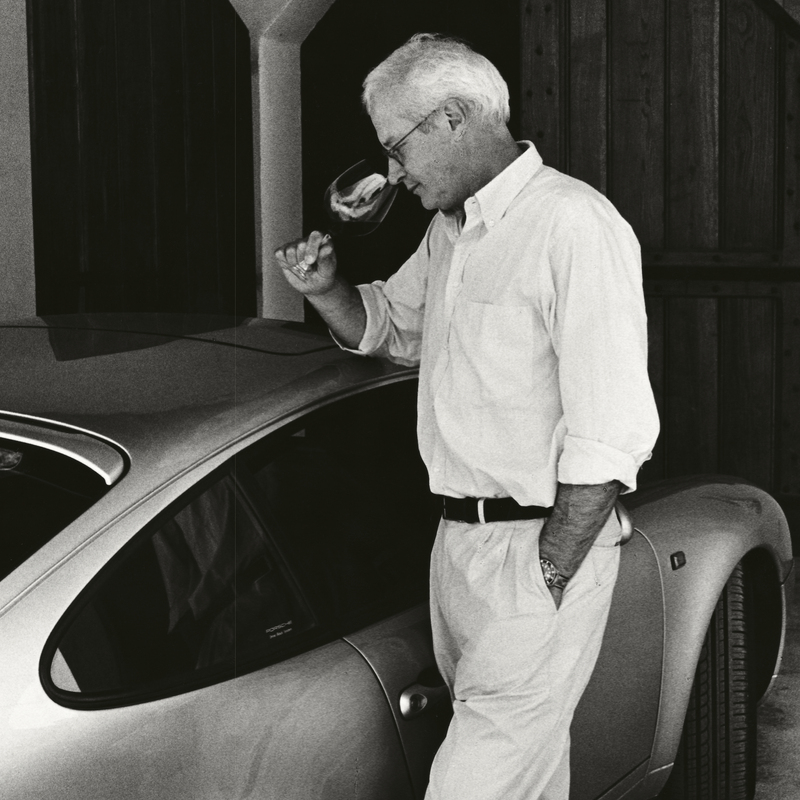 Marchesi Alberto di Gresy with two of his loves – a glass of Barbaresco and a fast car. 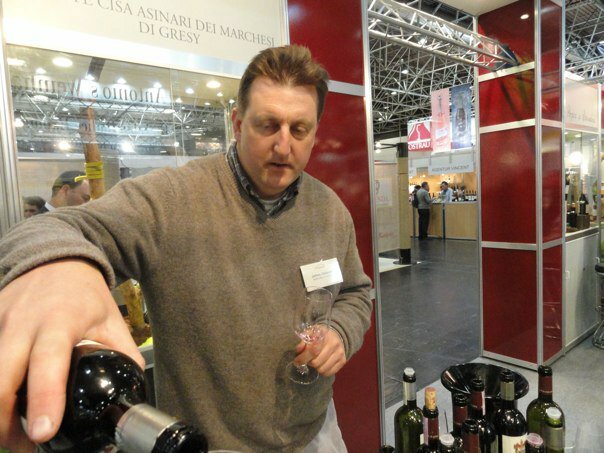 With excellent fruit from four estates in the Langhe and Monferrato zones, di Grésy grew his portfolio to 16 red and white wines. Thanks to his dedication to the terroir and the highest standards of vineyard and cellar practices, Marchesi di Gresy’s wines now reach discerning Barbaresco lovers across the globe. Chilcott’s tenure with Marchesi di Grésy began in 1991. He didn’t settle down full-time at the winery until 1998, following a few years of “door knocking” that lead to work in Burgundy and wine regions of New Zealand and Italy. As cellar master, Chilcott manages the day-to-day operations in the cantina, but he also has an important marketing function as one of the winery’s Anglophone emissaries. The seasons have blurred for Chilcott and there is always something for him to do. Neither grapes nor wines can wait when attention is needed. Throughout the year, Chilcott works closely with winemaker Matteo Sasso and oenological consultant Piero Ballario. After the rigors of the harvest and demanding work in the cellar thereafter, Chilcott returns to New Zealand for well-deserved rest and visits to his native country’s expanding wine regions. It was on his return leg across North America of his recent New Zealand trip that Chilcott is stopping briefly in Colorado. 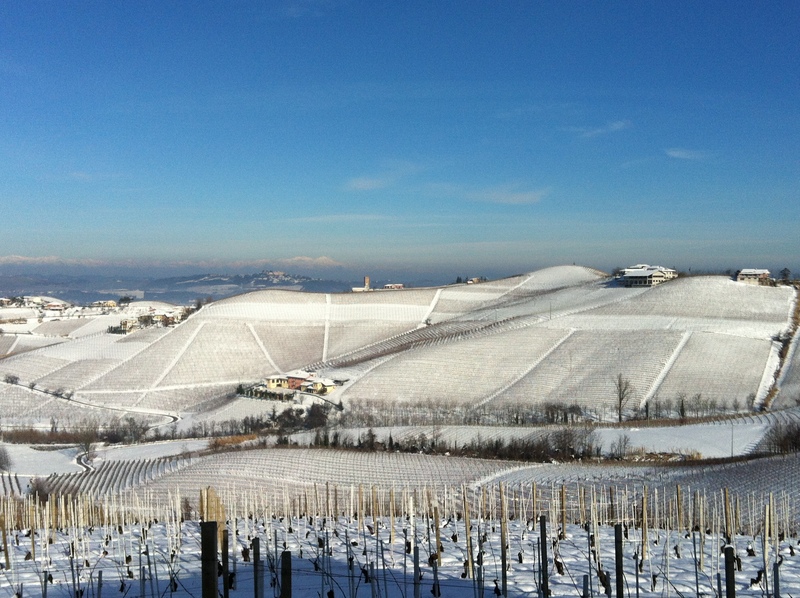 The Nebbiolo vines in the Martinenga amphitheater sleeping under winter’s warm “duvet” of snow. The first wine in the Marchesi di Grésy flight was 2011 Dolcetto d’Alba from vineyards that ring Monte Aribaldo. Although Langhe’s Dolcetto sadly is falling out of favor, due in part to a greater choice of white wines in the region, Marchesi di Gresy and their customers have enjoyed increased sales in the United States. Chilcott describes the 2011 Dolcetto as “quite rich for a Treiso Dolcetto.” The warm vintage with a lower crop yield produced a “nice extract, made just right in tanks without too much skin contact.” Dolcetto is perfect for daily enjoyment as an aperitivo or at any stage of the meal. Although they make world famous wines, it’s humble Dolcetto that graces family tables of Langhe winemakers. 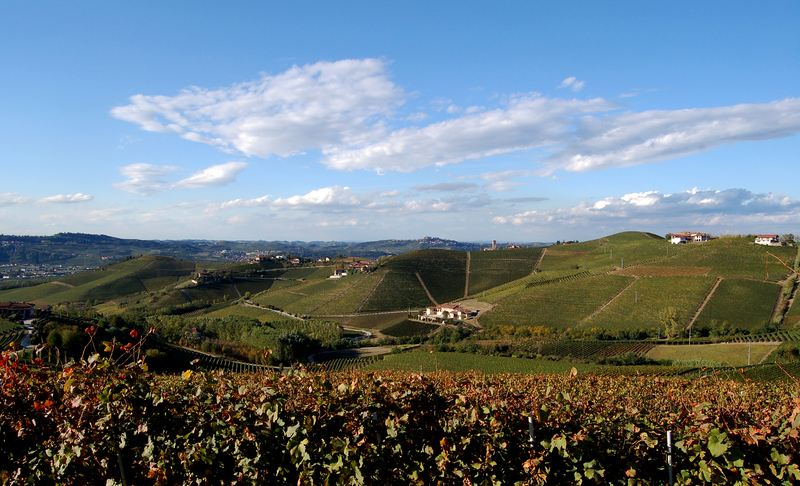 The global popularity of Nebbiolo from all regions of Piemonte, particularly the Langhe and Roero, continues to climb. Made from the same varietal as its big brothers Barbaresco and Barolo, this wine sells for a much lower price, yet has the potential to age. The ruby red 2013 Martinenga Langhe Nebbiolo emerged from a vintage that worried many producers in the early rainy months of the growing season, but finished strong after the sun emerged in June to produce an excellent, late-picked crop. Unlike Barbaresco, this Nebbiolo sees no oak and ages in cement tanks. In spring 2014, the winery bottled this Nebbiolo Chilcott describes as “classic and very inviting, an almost extra-virgin style, great for casual dining.” Chilcott suggests Langhe Nebbiolo for frequent enjoyment of the powerful varietal. On a personal note, the wines from Marchesi di Grésy were the first Piemonte wines my husband and I purchased in 2000. 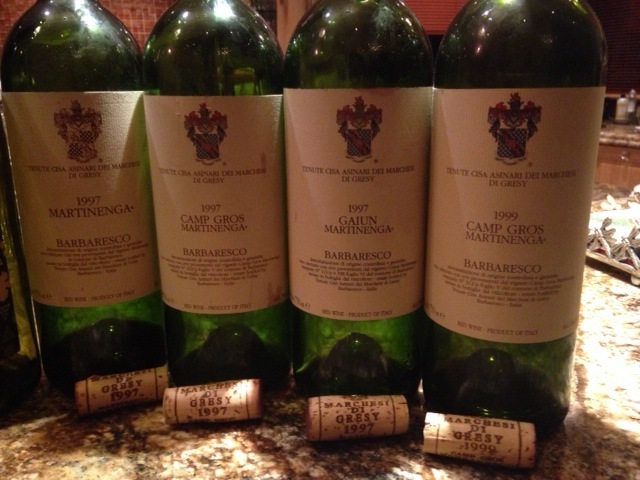 Recently, we opened all three of the winery’s Barbarescos from 1997. Made from grapes from different parts of the same vineyard, each wine maintained its bright, garnet color and had its own distinctive aromas and flavors ranging from red fruits to barnyard and earth. Fifteen years after bottling, the wines are still fabulous representatives of the hot, yet highly regarded vintage. The remaining bottles will contain to develop beautifully over the coming years. Marchesi di Grésy’s lovely Langhe wines are sold throughout the world. If you wish to locate the wines in any country except the United States, contact Marchesi di Grésy directly. Marchesi di Grésy’s USA representative is Dalla Terra of Napa, California. Contact them for assistance in finding these wines in your state.